An extension cord and cord cover combined into one convenient unit helps eliminate clutter created from numerous cords. Durable to withstand heavy foot traffic. Suitable for office and industrial environments. Made of flexible PVC moisture resistant materials and heavy duty 16 gauge cord. Cord is ready to use with grounded AC duplex receptacles. Features 10' extension cord, including outlet box, plus 2' lead cord. Rated at 13 amp, 125 volt. UL listed. Black. I'm Roberto at C-Line and today we're going to talk about our Lay-Flat Power Extension and Cord Cover. This product is a combination extension cord and cord cover in one. It's made of flexible PVC, moisture resistant materials with a heavy 16 gauge cord and two power outlets. The Lay-Flat Power Extension and Cord Cover is UL listed. It's rated at 13 amp, 125 volts and 1625 watts. There's a two foot lead cord that is ready to use with a grounded AC duplex receptacle. The durable cover withstands heavy foot traffic and makes it suitable for office, school, retail and industrial environments. 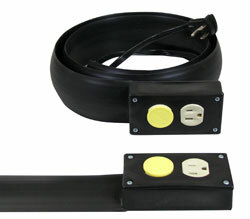 Help maintain a safe work environment with the Lay-Flat Power Extension and Cord Cover. Order yours now! That's all we have for you today. I'm Roberto at C-Line. Thanks for watching.